Amorth and Kožul served as Editors for the Italian edition of Bubalo’s book A Thousand Encounters with the Madonna. The Apparitions of Medjugorje Recounted by the Visionary Vicka. In A Thousand Encounters, Fr. Bubalo relates a conversation he had with Vicka wherein they discussed a controversial event involving another alleged Medjugorje visionary Ivan Dragicevic. According to Bishop Peric in Questionable Games, five of the six Medjugorje “visionaries” were approached in May, 1982 by an official Diocesan commission. The commission requested the children write down the contents of the great sign allegedly predicted by the Madonna. All five declined to do so, saying Our Lady forbade it. Despite the above setback, Peric continues, the commission went to see Ivan who was miles away in seminary and without a working phone. The commission approached him with the same request and he willingly obliged, writing on two pieces of paper the contents of the alleged sign. These papers were each sealed in separate envelopes with the Diocesan seal. One envelope was given to Ivan and the other to the Diocese. “Visionary” Vicka Ivankovic (right) with author Fr. Janko Bubalo (left). Within a few years, Peric writes, Ivan denied having written the contents of the sign. In March, 1985, the Diocese’s envelope was produced, opened, and its contents demonstrated Ivan was not telling the truth as the text was in Ivan’s hand detailing what the alleged sign would be. J[anko]: Once, the members of the episcopal commission asked you, and you specifically, to describe the Sign in writing, how it will happen and when it will appear, so that then the writing could be enclosed and sealed in front of you, and be preserved until the Sign appears. There appears to be little information in English about Fr. Smiljan Dragan Kožul. However, Fr. Amorth’s support and even endorsement of the Medjugorje phenomenon is a well-established fact to English-speakers. In a 2002 interview, Amorth is quoted as having said, “Medjugorje is a fortress against Satan. 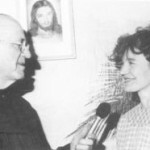 Satan hates Medjugorje because it is a place of conversion, of prayer, of transformation of life.” Amorth says later in the same interview, “Here in Medjugorje, Our Lady insists again that the laws of the Gospel are respected” and elsewhere admits to having led a Medjugorje prayer group since 1984. In recent weeks, Fr. Amorth specified his position on Medjugorje in an interview with the publication Globus. Amorth said, “I think that the apparitions are authentic” (Mislim da je ukazanje autenticno). In the same interview, Amorth revealed he had kept Joseph Cardinal Ratzinger, now Pope Benedict XVI, abreast of developments on Medjugorje shortly after Amorth’s pilgrimage there in October, 1981. With this new revelation, Amorth joins Fr. 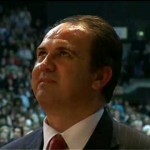 Rene Laurentin who also claims to have spoken with the Pope (John Paul II) on Medjugorje. Laurentin himself has recently come under scrutiny for information he edited concerning Medjugorje (see also here). Two months after Peric wrote Questionable Games, the Holy See announced it was establishing a commission of inquiry into the Medjugorje phenomenon. Its conclusion(s) are eagerly anticipated by many of the faithful around the world. J. Bubalo, A thousand encounters with Our Lady, pp. 134-136, II. edition, pp. 166-168. J. Bubalo, A thousand encounters with Our Lady, Jelsa 1985….Medjugorje, II. edition, 1998. I was there during Holy Week 1987 and if the lines for confession are a sign of authenticity, it is from God. I also spoke with the head of a prominent conservative religious order who heard those confessions and he says he feels that it is authentic. He does not speak publicly, deferring as I will, to the Church’s decision. I disagree. Long lines for confession are signs of grace. I do believe Our Lady appeared in Medjugorje to the seers long ago but I do not believe she appears there any longer. People with faith, those who seek to know God and to serve Him, bring blessings to Medjugorje and to each other. It seems to me that some of the seers travel and have Our Lady travel with them at their convenience and give her appointments to appear. it has become like a circus. We do not hear from the youngest seer, the one I have always believed in. One of the major issues of our time, the slaughter of millions and millions of humans in the womb does not seem to interest the seers or the ‘Lady’ that they say appears to them…very strange. Mary is our Mother and every mother would speak out against the horror of watching her children slaughtered. Also, when there was criticism about the fact that the ‘vision’ spoke on short sentences, almost immediately afterwards, the visionaries claimed Our Lady gave them longer messages…I’ll wait for the Church to decide. I believe people should still go on Pilgrimage to Medjugorje because I believe Our Lady was there earlier and their sacrifice and their true seeking will keep her there, will enable them to find her there…always. I do not recall remarking about Confession in the above article. Kevin, is this what you do with your time? Try to prove apparition sites invalid? I am so sorry for you. Can you show me where in the above article I said “Medjugorje is not supernatural”? I am profoundly saddened that this ridiculous masquerade is still going strong after all this time, after all the contradictions inherent in it and after all the findings of the competent authorities who have officially pronounced on it. Only those willfully blind fail to see that when this house of cards eventually falls that there will be a period of such profound disillusionment that many Catholics will lose their faith over it. Fr Amorth is only a small blip on the radar screen. The whole Medjugorje charade was exposed in 1981 by the late Hamish Fraser, in the same year by the late Brother Francis, MICM (who said, quite simply, that Our Lady does not speak heresy. He was referring, of course, to the oracle’s pronouncement that “all religions are pleasing to God”), by Brother Michael in 1984 whose magisterial study completely and thoroughly demolished the whole thing and other writers too numerous to mention. Good people, stop accepting such nonsensical contradictions as authentic visions of Holy Mary. You owe it to yourselves and to the one, true Church to which you belong to find out the truth. In this internet age that is not difficult to do. I do not think those people you mentioned are very well known. Can I ask you have you ever been there ? My reason for being skeptical of Medjugorje is the disobedience surrounding it. St. Teresa of Avila and others always upheld ecclesiastical obedience. If a phenomenon encourages disobedience, run. It is not legit. It does not matter how many graces are imparted. Just as God will allow a bad thing to happen for a greater good, the devil will allow lesser goods to happen to create a greater evil. I’ve been to Mostar which is farther up the road from Medjugorje. There’s plenty to see there! Also, the then Yugoslav government responded to the apparations at Medjugorje by placing the local parish priest in jail, citing “anti-state activities” (as they defined it) for 3 1/2 years and sending police to cordon off the town to visitors for roughly the same amount of time. We must pray for all involved here. The Vatican commission has met individually with each of the Medjugorje seers. That is more than Bishop Peric has done. But then again, if he doesn’t believe in any Marian apparitions, such as Lourdes or Fatima, why should he believe in Medjugorje? And of course, he would be inclined to find whatever scraps of evidence he could to disparage the visionaries. Those who only report on such disparaging comments are also guilty of making disparaging remarks about people whom they know nothing about which borders on the mortal sin of calumny. As for disobedience, how have the seers been disobedient if the Bishop has never communicated with them? Seeing this article now, 2 years after publication… It’s been at least 15 years since I’ve watched ‘Visions on Demand’, an in-depth expose on Medjugorje that makes a very solid case against its authenticity. The faithful should be advised against making personal determinations about Medjugorje based on ‘good things’ that happen there, such as long confession lines, or conversions to the Faith, etc. This is a dangerously superficial assessment of such a phenomenon. Anything from satanic influence to individual conviction can cause such results – and if it is satanically influenced, of course there would have to be pudding covering over the poison. Knowledge of details – both of these supposed apparitions, and other apparitions in history, is crucial for proper impartial perspective. Revisiting this again after more in-depth study of Fatima, for example, further informs me that Medjugorje is untrustworthy. So many of the details of it are merely mimics of Fatima – the ‘seers’ claiming (conveniently) that they cannot divulge particular secrets, for 1 example. Yet, we must contrast the stark difference surrounding that one detail between the two apparitions. The Fatima children suffered mockery, alienation from their friends, Lucia was nearly disowned and at times suffered corporal punishment by her parents – and let’s not forget that they were authentically threatened by the government officials to be boiled alive in oil. Through all, they showed heroic bravery and further displayed their already established reputation for honesty. Through all, they were consistent. When interrogated separately about obscure details (details young children would likely not have the foresight to agree upon in advance if fabricating tales), they replied consistently with one another. They bore endless exhaustive interrogations. They became obviously sanctified. Francisco and Jacinta suffered holy deaths without complaint- but instead, with great patience, and even joy at times. Time would eventually reveal all 3 secrets as promised by Lucia, and history and the secrets lined up. In contrast, the Medjugorje seers seem flippant in their refusal to divulge secrets, and inconsistent. They have seemingly easily shrugged off any efforts to interrogate them, under the mock excuse of having to keep a secret. Their lives have been mostly like those of luminaries, instead of those scorned. In other words, any truth in them has not been refined in fire like that of the Fatima children. Lastly, the message they supposedly bear is nothing truly informational – certainly nothing requiring years and years of continual visitation. The Catholic Church, wise in knowing the complexity of such phenomena (and anti-phenomena), and what impact hasty decisions, let alone long-arrived at decisions, can have on the faithful, does not render a concrete statement yet. This, especially in light of lesser but more immediate statements made by the local bishop, etc., should not be taken as approval of legitimacy. Instead, I believe what we are seeing is the Church letting these seers debunk themselves over time. What is a major consequence of devotion to an illegitimate apparition? This one in particular (as Visions on Demand so eloquently argues) can addict a follower to ‘spiritual sweetness’ – a constant sweet drip of perceived revelation, which ultimately removes the need for faith, and is dangerous for its inauthenticity. Also, it distracts away from authentic messages Our Lady has come with. The Fatima message is a crucial one for our times. It seems many Medjugorje devotees care not much, if at all, for Fatima…or Lourdes. There is something to that.